Pete Tapley + classic Alex Lowe route + Metallica + sketchiness on multiple counts = AWESOME! Great story! 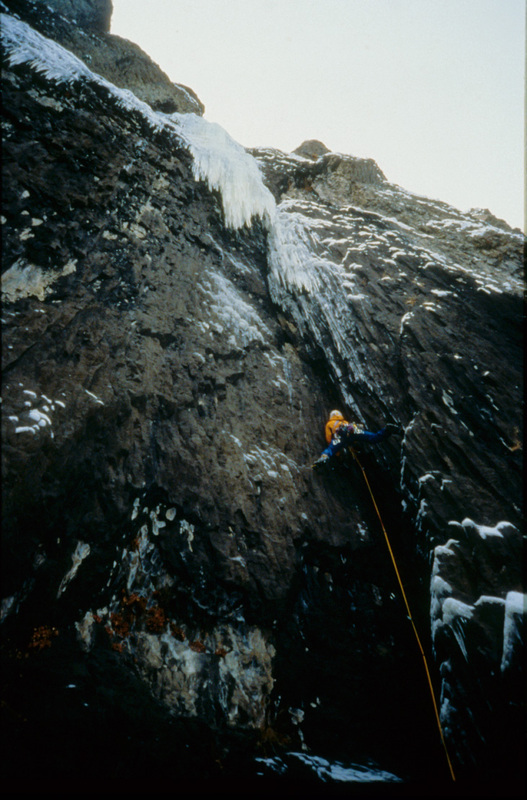 Pete has definitively been a contributing factor to many an aspiring climbers career. uh Kell? I think you are terminally equipped with the moniker, Sketchy Kelly, but we could start naming’ the little karmic good freakin’ luck fairies that flutter around your noggin’ when you climb! lol! Yeah, I was also thinking about that term “old moniker”. How do you outgrow a moniker? When is an old one no longer useful? I’ve never heard the term “new moniker”. Fascinating. BTW, did you ever get your tool down after you lowered off it? ha, good point, Peter. hmmm, “old moniker” — maybe like a wart you’ve had forever, can’t remember how or when it started, but it’s not going away, no longer useful, never was? yeah, afterwards we found a way to hike around and bushwhack along the top and lower in off a tree, and get my tool. near-death be damned, we’re cheap! hope you’re doing well up there, and skiing a ton. I can’t wait for the follow-up. In my mind you are becoming “Legendary Kelly”, with the likes of Jack Tackle and the late Dwight Bishop – Great alpinists who recovered from setbacks. Cheers. thanks, Olin. man, really appreciate the good words, and it’s funny/ironic, eh? your comment came soon after i’d wrecked myself good, so i guess i have another opportunity to recover from a setback. damned character-building experiences….but what is life without challenges and surprises, right? hope you’re getting after it and living life to the fullest. I agree. Thanks for the stoke and reflections Kelly. Blogging is changing everything… well a lot of things anyway. thanks a bunch, appreciate your reading, glad you dig it. funny, after all those years of making fun of blogs, here i am…and, don’t tell anybody, but i’m really enjoying it. glad you are, too.